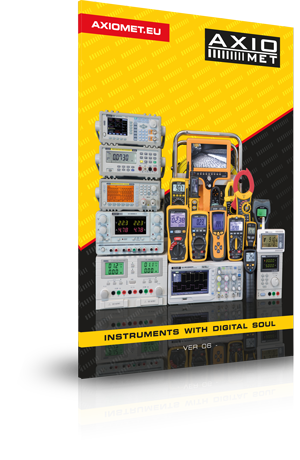 AXIOMET’s AX-215TIC and AX-205T clamp meters are digital handheld devices. They are equipped with a TrueRMS converter to conduct measurements of distorted current waveforms. Both models have similar functionalities, but the AX-215TIC model also enables measurements of direct current, frequency, and capacity. The remaining metrological and functional parameters are identical. when galvanic separation of a measurement device is required. Clamp meters are especially useful in the power industry for diagnosing and measuring electrical circuits, as the clamp allows for measuring inrush currents. They are also very helpful in measuring currents in power supply systems with battery backups or in industrial automation systems powered by 12V, 24V, or 48V DC. In such cases, it is not recommended to conduct current measurements by disconnecting an electrical circuit, as this may result is the loss of system settings. higher harmonics (sinusoidal distorted, non-sinusoidal). In such cases, a clamp meter is far more precise than a traditional ammeter. Due to this fact, the AX-215TIC and AX-205T devices from AXIOMET are used in measurements and diagnostics of all converter systems, electrical drive systems, inverters, and high power AC/DC and DC/DC switch-mode converters. Taking into consideration all the additional features, such as measuring inrush currents, as well as other measuring capabilities of electrical values, the AX-215TIC and AX-205T meters are very universal and attractive measurement devices. The AX-215TIC and AX-205T clamp meters are useful in diagnosing electrical circuits, and in measuring power supply systems with battery backups or in industrial automation systems.